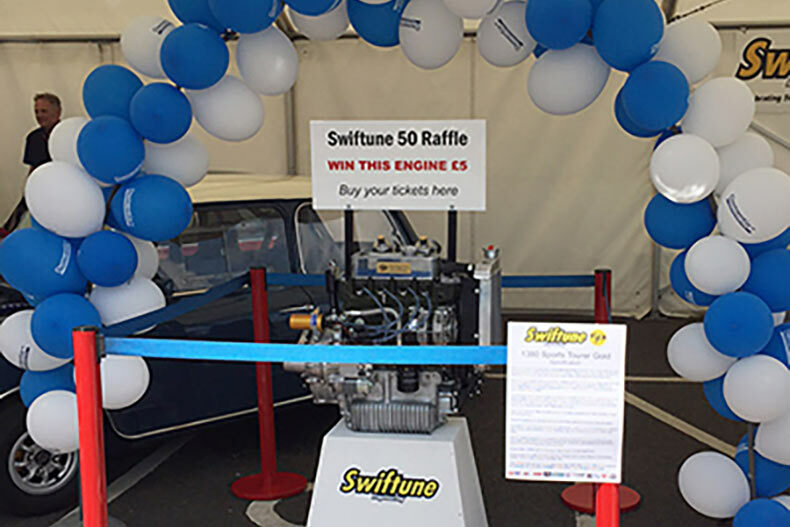 In celebration of our 50 years, we raffled of a Swiftune Engine for just £5, held an auction dedicated to Mini racers featuring tyres, fuel and test days, and finally we held the Swiftune 50 Allcomers Race which was open to any type of Mini’s. The profits from the Raffle, Auction and Race were donated to Dementia UK, a charity that raises money for Admiral Nurses, who provide crucial care for people living with Dementia and their Families. The raffle began in March in which tickets where sold online through our website and at various race meetings for just £5. Along with the chance of winning an engine, there was also 2 consolation prizes including 2x tickets to the BTCC final at Brands Hatch as guests of Pirtek MG and a selection of Swiftune 50 promotional products. Tickets were also sold throughout the weekend of the Brands Hatch Mini Festival (27/28 June) and along with donations just under £4,000 was raised. The raffle was drawn on the Sunday grid walk at Brands Hatch and the lucky winner of the engine was revealed to be Craig Lemon from Victoria, Australia! The auction raised £2,000 on the Saturday night, in which historic Mini racers bid on prizes such as tyres, fuel/oil and MSV test days. Along with the race and the online sales of raffle tickets, we have raised just under £12,000 for the charity. A massive thank you to everyone that bought a raffle ticket or made a donation!